As the largest construction project of the award winning State-of-the-Art Nitrogen Upgrade Program (SANUP), the NMF contains a sustainable planning, design, and construction program cooperatively developed by AlexRenew and lead consultant CH2M. The SANUP program operates within industry best practices for energy efficiency, while reducing potable water consumption, mitigating health and safety risks, increasing community relations, reducing the use of chemicals, and using environmentally preferable materials. The NMF stores wastewater to balance the amount of nitrogen that goes into AlexRenew’s biological treatment process. This helps reduce the amount of chemicals and energy needed to clean water and ultimately helps reduce the amount of nitrogen discharged into the Chesapeake Bay watershed. After treating the wastewater it receives from the City of Alexandria and parts of Fairfax County, the water resource recovery facility discharges the water into Hunting Creek and the Potomac River. The Nutrient Management Facility is the latest addition to the urban water resource recovery facility’s campus. AlexRenew’s facilities, including the NMF, are designed to meet some of the strictest wastewater treatment standards in the world. Natural World (NW): The Nutrient Management Facility was designed to preserve floodplain functions by avoiding new development within the floodplain. Acres of impervious surface were replaced with vegetated areas to restore infiltration and water quality functions. A fish and sediment barrier was removed, which improved aquatic habitat connectivity, and a crucial wooded riparian buffer was expanded, enhancing the natural habitat. Leadership (LD): Sustainability is a core value of AlexRenew, and the NMF project was planned, designed, and constructed in accordance with the sustainability strategies developed by CH2M and AlexRenew for the State-of-the-Art Nitrogen Upgrade Program. Sustainable priorities, goals, and targets were tracked during design and construction, and further validated through the use of the Envision sustainable infrastructure framework and rating system. The project is tangible evidence of both organizations’ strong commitments to sustainable development as demonstrated in their public-facing environmental policies and vision statements, organizational structures and business processes. Quality of Life (QL): Many considerations to improve community quality of life were incorporated into this project, including a multi-purpose lit athletic field, built on top of the NMF. The field will soon be operated by the City of Alexandria’s Department of Recreation, Parks, and Cultural Activities. 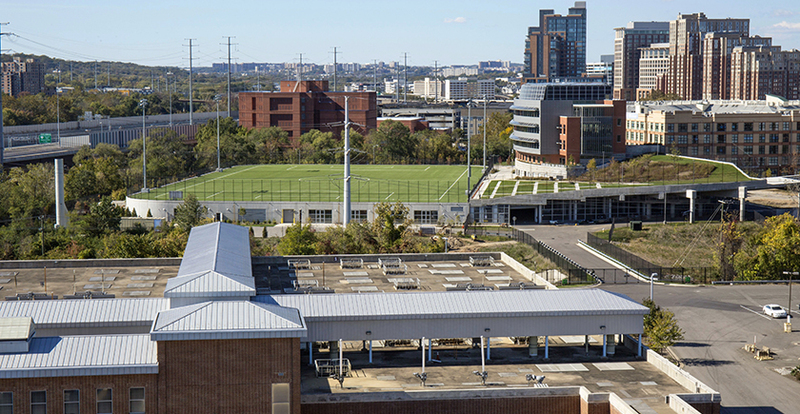 By building the athletic field, the NMF project restored previously inaccessible land, and added a recreational amenity to benefit the citizens of the City of Alexandria. The site plan includes a trail connection to a large greenspace that will be constructed within a mixed-use development in the adjacent property. The project also included consideration of views and appearance in the design criteria at every stage. It restored the site with high-quality architectural and landscaping standards that integrate well with the community. The Envision Platinum award will be presented by Anthony Kane, ISI Vice President for Research and Development, at the AlexRenew Board meeting on Tuesday, December 20, 2016 at 6:00 p.m. at the Alexandria Renew Enterprises Environmental Center, 1800 Limerick Street, Alexandria Va.
To learn more about the NMF, please visit alexrenew.com/SANUP.